Vintage: Clothes, accessories and objects whose age and quality makes them unique, precious and valuable. 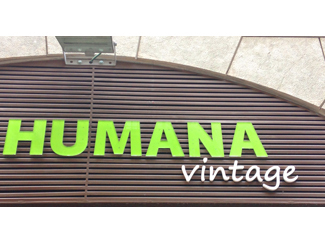 That's what you can find from today in Humana Store in 41, Asturies Street, in Barcelona, ? ?in the Gracia district. This reopens its doors become a space dedicated to this type of clothing and accessories. It has a sales area of ? ?180 m2 on three floors. The interior design has changed, following the basic lines of sustainable decor, using reused as fruit crates, industrial pallets or old iron furniture materials. This is the first store of its kind Humana. However, in the rest of the network of local second hand of the Foundation is also possible to find vintage items. Moreover, today, 13, January we held the total renovation of the clothes available in the 29 Humana stores, located in Barcelona (12), Madrid (13) , Sevilla (2) Granada (2).